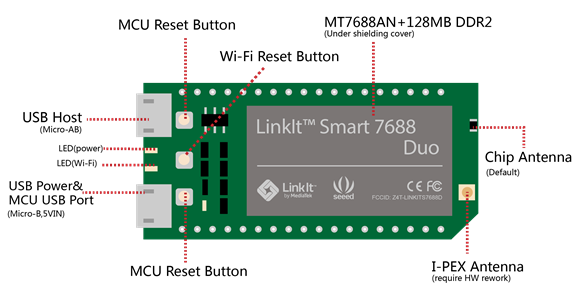 Notify me by email when LinkIt Smart 7688 Duo becomes available. Linklt Smart 7688: MPU only. Powered by Media Tek MT7688. Linklt Smart 7688 Duo: MPU and MCU. Powered by Media Tek MT7688 and ATmega 32U4. LinkIt Smart 7688 Duo is an open development board compatible with Arduino Yún sketches, based on the OpenWrt Linux distribution, MT7688 and ATmega32u4. The board is designed especially to enable the prototyping of Rich Application IoT devices for smart house or office. Since it is well compatible with Arduino, this allows you to use different features from Arduino Yún and LinkIt Smart 7688 Duo, which will help you build rich applications based on various, robust and compiled Arduino Yún sketches. The board offers you the memory and packet storage to enable robust video processing. The platform also offers options to create device applications such as Python, Node.js and C programming language. 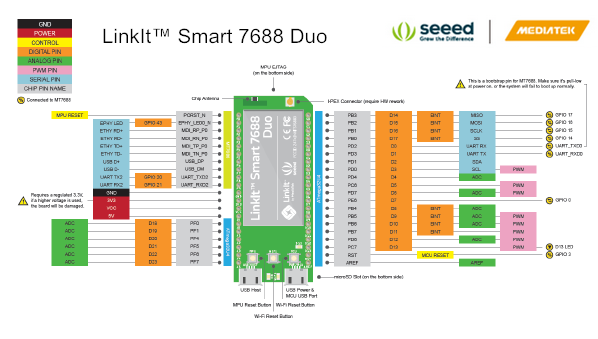 LinkIt Smart 7688 duo is a co-design product by Seeed Studio and MediaTek. It brings together the parties' knowledge in open hardware and industry leading reference designs for IoT devices to create this powerful development board. LinkIt Smart 7688 duo is fully supported on the MediaTek Labs site: check out the LinkIt section and register here to download the SDK, participate in the Forums, and more. It will remind you once you have a new Likes from your facebook page. 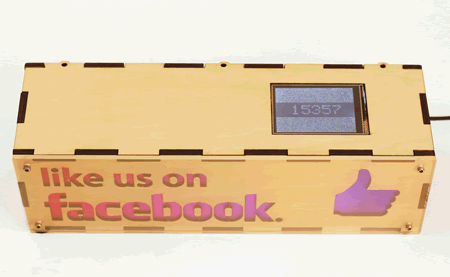 The device will vibrate，the lights will twinkle, while the screen will show the real time facebook likes. Please visit our Wiki page for more info about this product. It will be highly appreciated if you can help improve the documents, add demo codes or tutorials. For technical support, please post your questions to our Forum.